This bright and airy contemporary first floor apartment is situated in Muo, a pretty village within 15 mins walk of Kotor old town and has spectacular views over the Bay of Kotor and the surrounding mountains. It is a fully-equipped self-catering apartment whose open plan living-dining room leads out to a spacious terrace which is ideal for alfresco dining, watching the boats on the fjord or simply relaxing. Completed in Summer 2007, the apartment is situated on the first floor and has two large bedrooms, two bathrooms (one ensuite to the master bedroom), a fully equipped kitchen and separate utility room, air-conditioning, two private balconies, a shared pool with a splash shower, private parking and with the double sofa bed in the living room it can accommodate up to 6 persons. The air-conditioning and heating ensure it is cool in summer and warm in winter. There are restaurants and bars and a local shop within easy walking distance. A short holiday trip to Montenegro has now become a blissfull haven to escape to with the recent purchase of this beautiful apartment in Kotor! The old rustic charm of Kotor Old City and the genuinely friendly and hospitable nature of the Montenegrin people, priceless! The trip made such an impression that by the third day of my holiday, I was already out viewing apartments! Fastforward two months later, I'm the proud owner of Kotor Muo which I instantly knew was the one - from the very short pleasant car journey from Kotor Old City through the pretty quiet village of Muo, to stepping into the apartment and quickly greeted with a bright and airy space with breathtaking views of the Adriatic Sea and stunnning views of the Montenegrin landscape. Kotor Muo is definitely a delight and comfort to stay and relax in. 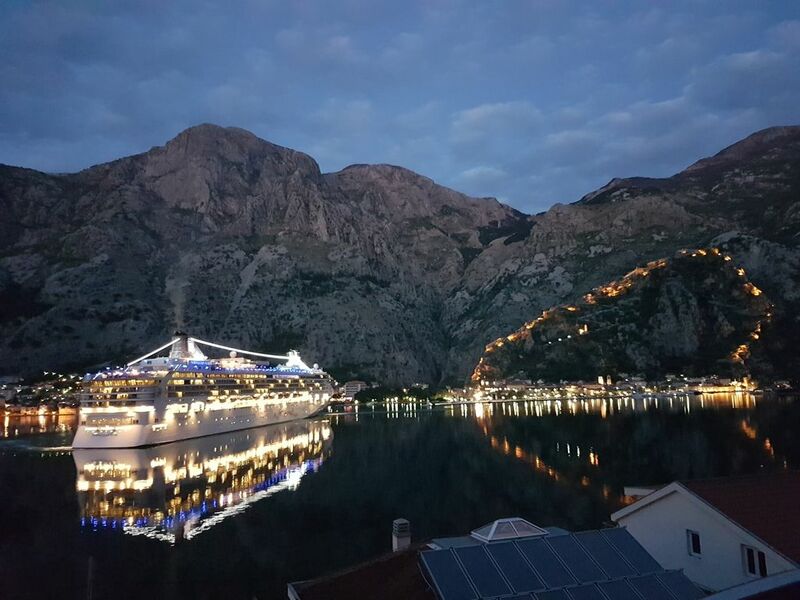 Kotor Muo enjoys stunning views by day and certainly by night too! A short 5 mins walk and you're already by the beach soaking up the sun and enjoying the cool waters and a further 20 mins walk takes you right into Kotor Old City for some lunch or dinner at the various restaurants on offer. Sip on cocktails or enjoy a cuppa by the balcony while watching cruise ships or boats coming and going - an activity which can be enjoyed for hours! No exact words can express the feeling of being in Montenegro. It's truly a magical place which you'll just have to visit at least once in your life to fully understand the love and affection one has for Montenegro. Two modern, recently renovated, fully tiled bathrooms. En-suite to bedroom 1 has a wc, wash hand basin and a shower enclosure. Bathroom 2 has similar facilities. Large open plan living/dining room with doors onto a spacious balcony. Dine indoors at the 6 seater dining table or for alfresco dining use the table and chairs on the balcony. There is a large sofa bed, satellite TV, DVD player and a stereo. The well laid out, spacious kitchen is well equipped with everything you need including a fridge/freezer, a dishwasher, oven, hob, microwave, kettle and all the utensils you need from bottle openers to salad bowls! Notes on accommodation: The apartment itself is perfect for all ages as it is open plan and spacious. The balcony area serve as an extension to the apartment. Outside: Within the landscaped grounds, there is a communal swimming pool and splash shower, all for the exclusive use of residents. This is in addition to the private parking enjoyed by visitors to the apartment, and all within 2 minutes walk of the water of Kotor Bay. Guests can head off for a dip in the bay in the morning and to the pool for the rest of the day! Patio furniture is provided for the balcony off the living room so guests can sit and watch the sun set sipping a cold drink. Utility Room: There is a washing machine in the utility room in case you need one along with an iron and ironing board. Cleaning / Towels / Linen / Maid service: Towels and linen are included for use in the apartment. Please bring your own beach towels for the pool or beach. The property is cleaned and linen changed on changeover days. More frequent changes can be arranged at an additional cost if required. Other: A designated parking space is located directly outside the apartment building entrance so it is easy for unloading shopping, luggage and people! Thoroughly enjoyed our stay here. The apartment is well equipped and comfortable and close to local amenities. Taxis cost just €2 if you want to venture into Kotor itself. We had a car and travelled around the whole, stunning area. The only slight issues were that the air-con is only in the lounge, which means it is quite stuffy at night. We could also have done with an extra set of towels for the week. Note that you’ll also need to bring your own dishwasher tablets or buy locally. This is a lovely modern apartment in a quiet position. Muo is very pretty and it was well worth the daily climb up the steep road to the apartment to enjoy the views. We walked into Kotor many times which took about 20 mins. Try the cafe/bar on the right as you leave Muo. Food and drink very reasonable. The road is narrow with no pavement until you near Kotor so you have to be careful. The views are wonderful whichever way you walk around the bay. The management team are very efficient and organised a taxi for us which cost 20 euros each way. We did feel the apartment could do with a full length mirror, also blackout blinds and air conditioning in main bedroom. Air conditioning in the lounge was very welcome as it was hot when we stayed. Overall we had a superb time.The scenery in the area is stunning. Great apartment in the BEST location! Would highly recommend this apartment to anyone interested in visiting Kotor Bay as it is in the most fantastic location, in Muo, just outside Kotor Old Town; a lovely 20 minute stroll to the old town. The even better part being that you can see the old town (with it's city walls wonderfully lit up at night) built into the base of the mountains from the balcony which is total magic - a view you wouldn't have if you stayed on the other side of the bay. The apartment is incredible spacious, has everything you need in terms of facilities; microwave, oven, fridge freezer and even a washing machine. The company which the owner uses to manage holiday lettings is superb; Anka and her team met us in Muo (as we had a hire car) but she had even offered to pick us up from the aiport. We've had a fabulous time and would without doubt return at some point in the future. Der Panoramablick lässt die Unzulänglichkeiten in den Hintergrund rücken. Die schönen Stunden auf dem Balkon werden unvergessen bleiben. Das Wetter war angenehm mild, so konnten wir auch am Abend den wunderbaren Panoramablick genießen. Die Wohnung hält was sie verspricht, doch erscheint die Ausstattung teils erneuerungswürdig (Bettunterlage im Doppelbett, durchgesessenes Schlafsofa). Dank der sehr zuvorkommenden Unterstützung von Vanja, die Komplettierung der Wohnungsausstattung und die Organisation unseres Aufenthaltes betreffend, haben wir den Aufenthalt im Apartment sehr genossen. Vielen herzlichen Dank an Vanja. Leider ist das WLAN oft sehr langsam oder nicht verfügbar. Die Software des Routers ist veraltet und unsicher. Die Wohnung ist sehr geräumig und man hat vom Balkon eine wunderschöne Aussicht auf die Bucht! Zimmer und Bad waren auch sehr sauber. Leider die Küchenschränke und das Geschirr nicht. Hier müsste auch mal das eine oder andere ausgetauscht werden, z. B. Wasserkocher mit Rost innen. Lage war gut, wenn man ein Auto hat. Wir hatten eine sehr schöne Zeit in Muo. The apartment is a 2 min walk to the beautiful clear waters of Kotor bay and there are many little pebbled beaches along the waterfront to lay out on. If you prefer larger sandier beaches there are several within a short drive of the apartment. There is Jaz beach which is the most famous (where the Rolling Stones and Madonna played) or there is Plavi Horizonti which, with its restaurant, playground, showers and sunbeds and umbrellas for hire, is perfect for families. Tivat airport is only 10 minutes drive away on the far side of a mountain so no plane noise! Dubrovnik airport is about 90 mins drive (allowing time to cross the border), about 70km. Ferries cross from Bari in Italy to Bar in Southern Montenegro. Car hire is recommended as there are so many things to see (we can give you the number of the local car hire firm we use when we visit and if you prefer not to drive we can arrange a transfer you). Muo is 15 mins walk/5 mins by car from the UNESCO heritage Citadel of Kotor. Buses also run near to the apartment and taxis can be found in plentiful supply. It is worth doing a trip around Kotor Bay by boat, visiting Sveti Stefan (1 hour drive), the Tara Canyon (do a day trip), Perast (30 min drive), the many National Parks etc. The beauty of Montenegro is you can do as much or as little as you please. The town of Kotor with its many restaurants, bars, nightlife and shops is only a 15 min walk away. There are also some bars and restaurants locally in Muo itself which are only a 5 min walk from the apartment. Large supermarkets are a short drive away for a big shop, banks are in plentiful supply, visa and mastercard are widely accepted and the local currency is the euro. Montenegro itself is a beautiful country which is steeped in history and has magnificent scenery. You can spend your time on excursions around the bay and into the inland of Montenegro. Details of local tour operators can be provided. Changeover Day: Generally Saturday or Sunday in high season (July & August) but contact us and if we can accommodate you we will. Check in time is after 3pm and check out is 10am.